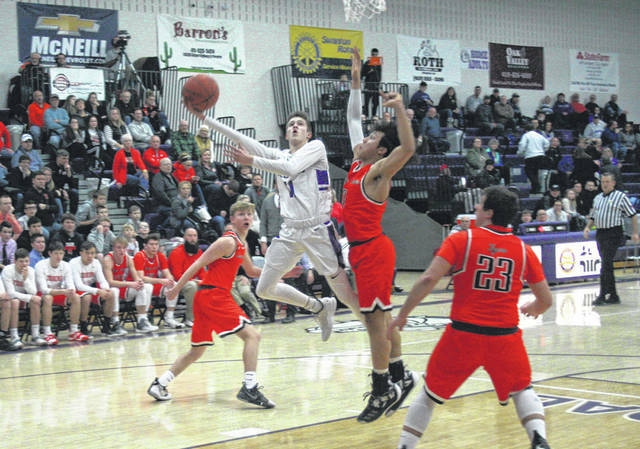 Jared Wilson of Swanton puts up an off-balance shot versus Liberty Center Friday night in NWOAL boy basketball. 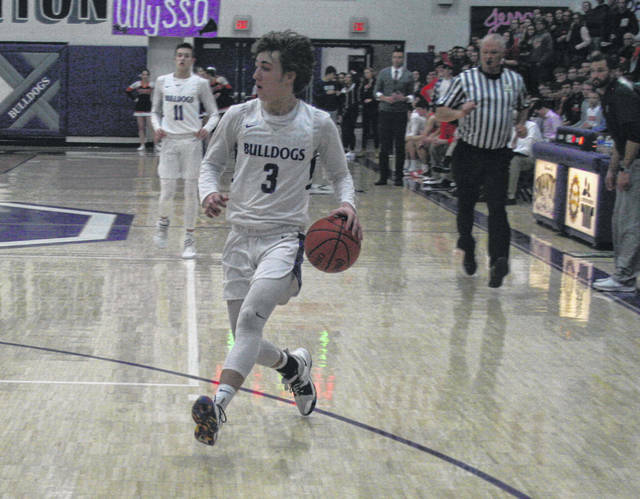 The Bulldogs earned their second league win of the season, downing the Tigers 44-42. Randy Slink of Swanton makes his way around a Liberty Center defender during Friday night’s contest. He finished with 12 points. 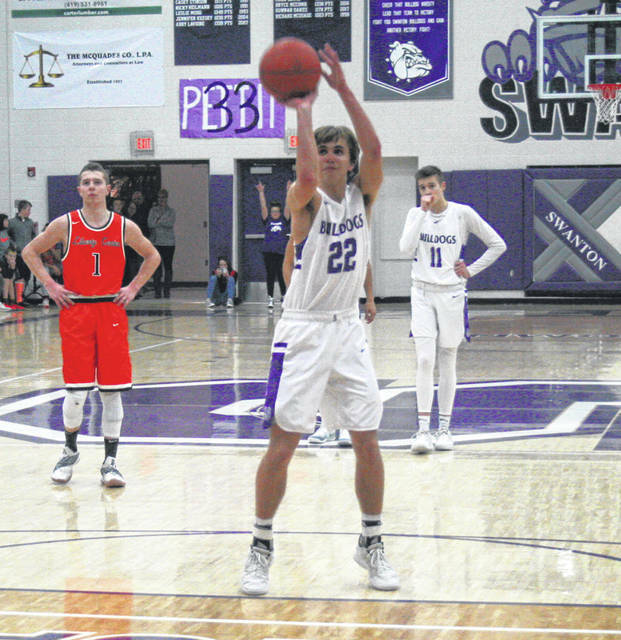 Swanton’s Dylan Gilsdorf with a free throw to put the Bulldogs up two in the closing seconds Friday. Swanton’s Josh Vance brings the ball up the court during Friday’s game. Once again Swanton boys basketball had a game go down to the wire. 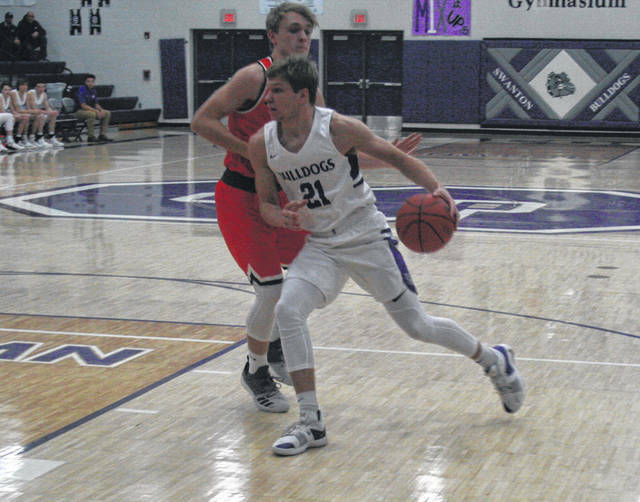 Despite jumping out early with a 12-0 run, the Bulldogs actually trailed in the fourth quarter before bouncing back in a 44-42 win over Liberty Center in Northwest Ohio Athletic League action Friday. The Bulldogs began the fourth quarter with a three point lead, thanks to a Jared Wilson triple at the end of the third. However, the Tigers took charge to start the final stanza. Camden Krugh knotted the score at 34 with a three 13 seconds in. After Randy Slink went 1 for 2 from the foul line for Swanton, Carter Burdue registered a three-point play to give LC a 37-35 lead. Wilson then split a pair from the line, but baskets by Conner Sonnenberg and Krugh extended the Tiger lead to five at the 3:15 mark. Slink would hit a pair from the line while Trent Murdock countered with 1 of 2 for LC, putting the margin at 42-38 with 2:07 remaining. The Dogs then got a big contribution from an unlikely source, when Justyn Bartlett came off the bench and drilled a triple with 1:34 left. The next time down the floor Slink knocked down a foul line jumper, giving Swanton a 43-42 lead. After an LC turnover, Gilsdorf split from the line to reach the final tally. Krugh missed what would have been a game-winning three as time expired. In the opening quarter four different Bulldogs scored – including six from Slink – to go ahead 12-0 with 2:48 left. The margin at the quarter break was 14-3. But, Krugh scored five in the first minute plus of the second around a basket in transition from Wilson, slicing the Swanton lead in half at 16-8. They continued to chip away, as C.J. Spradlin’s three cut it to 19-17 in the final minute of the half. Wilson drew a foul while shooting a trey as time expired, making all three freebies to extend their lead to five at the break. Wilson finished with 18 points while Slink added 12 for Swanton. Krugh had 14 for LC. Swanton (8-10, 2-3 NWOAL) travels to Toledo Christian (14-4) Tuesday before hosting Delta (5-13, 1-4) on Friday.